Specialty cruises, lakeside dining and Oktoberfest highlight the fall season at Heidel House Resort & Spa. Heidel House Resort & Spa is located on the shores of Big Green Lake. Autumn brings cooler weather, an array of colors and an abundance of events at Heidel House Resort & Spa. Heidel House, managed by Marcus Hotels & Resorts, has multiple yacht cruises, lakeside dining events and the 5th Annual Oktoberfest lined up for the upcoming fall months. Dive into adventurous tours of Green Lake onboard the Escapade, a custom-built, 60-foot catamaran-style yacht. Sightseeing Cruise: Through Aug. 30, the Escapade will leave daily at 9 a.m. and 3:30 p.m. for tours of Green Lake. These cruises gain excitement on Wednesdays for the Sangria Cruise, Thursdays for the Gilligan Cruise and Sundays for the Bloody Mary Cruise. Between Sept. 5 and Oct. 26, the Escapade will voyage every weekend. The Escapade will venture out at 9 a.m. Saturdays and Sundays and at 3:30 p.m. Fridays and Saturdays. 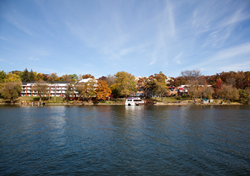 All cruise guests will learn about Green Lake’s history while enjoying picturesque, autumn scenery. Reservations are required. Beer Cruise: Cruise Big Green while sampling a variety of Wisconsin craft beer from a featured brewery. Enjoy light appetizers, panoramic views and delicious brews. The Aug. 15 cruise will feature Tyranena Brewing Co.; Ale Asylum will be featured on board the Sept. 5 cruise; and the final beer cruise of the 2014 season on Oct. 3 will feature Hinterland Brewery. Beer cruises set sail at 6 p.m. and dock at 7:30 p.m. Reservations and advance ticket purchase are required. Grey Rock Dine & Sail Experience: Bring date night to a new level with lakeside dinner followed by dessert and drinks on the Escapade. At Grey Rock, start your meal with soup or salad. Then choose an entrée of baked eggplant stack, seared ccallops, filet mignon or sweet tea brined grilled chicken. On the Escapade, sample desserts with your choice of a glass of wine or beer. Dinner is at 5 p.m. The cruise sets sail at 6:30 p.m. Reservations are required and space is limited. Heidel House Resort will also greet autumn with festive, outdoor dining events, all taking place on the shores of Green Lake. Pig Roast: Savor the flavors of a whole smoked hog and other barbeque favorites on the Heidel Terrace overlooking Green Lake. The buffet will seem endless, with roasted whole pig, grilled barbecue chicken, corn on the cob, southern mac and cheese, sweet potatoes, coleslaw, fruit pies and more! Resort guests and area residents are all welcome to enjoy this new Heidel House event from 6 to 8 p.m. on Wednesday Aug. 20 and Sept. 24. Lobster Bake: Celebrate the end of a great summer and the start of a beautiful fall with fresh seafood and live music along the lakeshore at Heidel House Resort’s last lobster bake of 2014. Held on the Grey Rock lawn, the lobster bake will include live Maine lobster, fresh shrimp, clams, sirloin steak and a soup and salad buffet. The last lobster bake is Aug. 29 from 6 to 8 p.m. Reservations are required. Finally, conclude the fall season by celebrating the German culture. Heidel House Resort & Spa welcomes all for the 5th Annual Oktoberfest, Saturday, Oct. 18. Take in the festive atmosphere as you indulge in a mouth-watering schnitzel and allow the beer maidens to fill up your stein or commemorative boot in the Beer Tent. Activities throughout the afternoon and night will add to the excitement including Klement’s Sausage Races, a polka dancing contest and the ever-popular Das Boot Relay. Don't forget your lederhosen! Before the night ends, someone will be crowned "best dressed" for their traditional outfit. No ticket purchase or reservations are required for this event. For more information on Heidel House events or to book your stay, call 800.444.2812 or visit http://www.heidelhouse.com. Since first welcoming its first guests on a snowy New Year’s Eve in 1945, Heidel House Resort & Spa has become a year-round Midwestern destination offering both summer and winter activities. Nestled on 20 wooded acres along the shores of Wisconsin’s deepest inland lake, this full-service resort offers numerous amenities including 190 guest rooms, 18,000 square feet of meeting space, lakeside dining at Grey Rock restaurant and luxurious spa services at the award-winning Evensong Spa. Selected as the 2014 Best Honeymoon Location in Wisconsin by Wisconsin Bride magazine, Heidel House is a favorite destination for weddings and social gatherings, in addition to offering a scenic setting for business and leisure travelers alike. For more information, please visit http://www.heidelhouse.com and follow us on Facebook and Twitter. Marcus Hotels & Resorts, a division of The Marcus Corporation, owns and/or manages 19 hotels, resorts and other properties in 10 states. A force in the hospitality industry, Marcus Hotels & Resorts provides expertise in management, development and historic renovations. The company’s portfolio includes a wide variety of properties including city-center meeting hotels, upscale resorts and branded first-class hotels. For more information on the latest news and updates, please visit: http://media.marcushotels.com and follow the company on Facebook and Twitter (@MarcusHotels).